162:3.1 It was during this visit to Jerusalem that Jesus dealt with a certain woman of evil repute who was brought into his presence by her accusers and his enemies. The distorted record you have of this episode would suggest that this woman had been brought before Jesus by the scribes and Pharisees, and that Jesus so dealt with them as to indicate that these religious leaders of the Jews might themselves have been guilty of immorality. Jesus well knew that, while these scribes and Pharisees were spiritually blind and intellectually prejudiced by their loyalty to tradition, they were to be numbered among the most thoroughly moral men of that day and generation. 162:3.2 What really happened was this: Early the third morning of the feast, as Jesus approached the temple, he was met by a group of the hired agents of the Sanhedrin who were dragging a woman along with them. 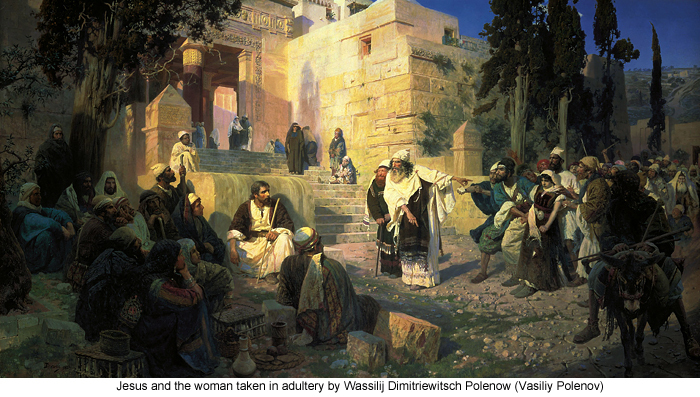 As they came near, the spokesman said: "Master, this woman was taken in adultery — in the very act. Now, the law of Moses commands that we should stone such a woman. What do you say should be done with her?" 162:3.3 It was the plan of Jesus' enemies, if he upheld the law of Moses requiring that the self-confessed transgressor be stoned, to involve him in difficulty with the Roman rulers, who had denied the Jews the right to inflict the death penalty without the approval of a Roman tribunal. If he forbade stoning the woman, they would accuse him before the Sanhedrin of setting himself up above Moses and the Jewish law. If he remained silent, they would accuse him of cowardice. But the Master so managed the situation that the whole plot fell to pieces of its own sordid weight. 162:3.4 This woman, once comely, was the wife of an inferior citizen of Nazareth, a man who had been a troublemaker for Jesus throughout his youthful days. The man, having married this woman, did most shamefully force her to earn their living by making commerce of her body. He had come up to the feast at Jerusalem that his wife might thus prostitute her physical charms for financial gain. He had entered into a bargain with the hirelings of the Jewish rulers thus to betray his own wife in her commercialized vice. And so they came with the woman and her companion in transgression for the purpose of ensnaring Jesus into making some statement which could be used against him in case of his arrest. 162:3.5 Jesus, looking over the crowd, saw her husband standing behind the others. He knew what sort of man he was and perceived that he was a party to the despicable transaction. Jesus first walked around to near where this degenerate husband stood and wrote upon the sand a few words which caused him to depart in haste. Then he came back before the woman and wrote again upon the ground for the benefit of her would-be accusers; and when they read his words, they, too, went away, one by one. And when the Master had written in the sand the third time, the woman's companion in evil took his departure, so that, when the Master raised himself up from this writing, he beheld the woman standing alone before him. Jesus said: "Woman, where are your accusers? did no man remain to stone you?" And the woman, lifting up her eyes, answered, "No man, Lord." And then said Jesus: "I know about you; neither do I condemn you. Go your way in peace." And this woman, Hildana, forsook her wicked husband and joined herself to the disciples of the kingdom. John 8:2 E arly in the morning he came again to the temple; all the people came to him, and he sat down and taught them. The scribes and the Pharisees brought a woman who had been caught in adultery, and placing her in the midst they said to him, "Teacher, this woman has been caught in the act of adultery. Now in the law Moses commanded us to stone such. What do you say about her?" This they said to test him, that they might have some charge to bring against him. Jesus bent down and wrote with his finger on the ground. And as they continued to ask him, he stood up and said to them, "Let him who is without sin among you be the first to throw a stone at her." And once more he bent down and wrote with his finger on the ground. But when they heard it, they went away, one by one, beginning with the eldest, and Jesus was left alone with the woman standing before him. Jesus looked up and said to her, "Woman, where are they? Has no one condemned you?" She said, "No one, Lord." And Jesus said, "Neither do I condemn you; go, and do not sin again."